Statua Roberti Fulton a sculptore Howard Roberts facta annis 1878–1883 in Capitolio Civitatum Foederatarum. Robertus Fulton (natus Little Britain in oppido Pennsilvaniae die 14 Novembris 1765; mortuus Novi Eboraci die 24 Februarii 1815) fuit inventor et constructor machinarum naviumque vaporariarum Americanus. Replica navis Clermont anno 1909 facta, anno 1936 destructa. Monumentum Fultonense urbe Rothomago anni 1918. Pittacium cursuale Roberti Fulton anno 1965 impressum. Robertus Fulton Philadelphiae in Beniaminum Franklinium, Londinii in Beniaminum West, pictorem Americanum, et Robertum Owen, conductorem Cambricum, Lutetiae in Iacobum Rumsey, ingeniarium et constructorem navium, incidit. Anno 1804, Londinii cura Gulielmi Pitt Iunior primi ministris Britannici armas ad usum classis Britannicae construxit. Classis militaris Civitatum Foederatarum saeculis 19 et 20 quinque naves nominis Fulton gessit. Robertus Fulton Aula Famae Inventorum nationalium inscriptus est. ↑ Nomen navis submarinae fons fuisse ad nomen navis in libro auctoris Iulii Verne 20 000 milia infra marem videtur. ↑ Canney, Donald L.: The Old Steam Navy, Volume One: Frigates, Sloops, and Gunboats 1815-1885. Annapolis, Maryland: Naval Institute Press, 1990. ISBN 0-87021-004-1. ↑ Situs publicus Aulae inventorum Americanorum. Situs publicus Musei maritimi fluminis Hudson de reconstructione navis Clermont. H. W. Dickinson: Robert Fulton. Engineer and Artist. Londinhii 1913. Cadwallader D. Colden: The Life of Robert Fulton. Novi Eboraci 1817. pp. 170, 171, 174, 274. Iles, George: Leading American Inventors. Novi Eboraci 1912, pp. 40–75. 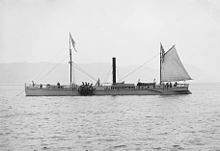 Alice Crary Sutcliffe: Robert Fulton and the "Clermont": The Authoritative Story of Robert Fulton's Early Experiments, Persistent Efforts, and Historic Achievements. Containing Many of Fulton's Hitherto Unpublished Letters, Drawings, and Pictures. 1909. Heinz Neukirchen: Seemacht im Spiegel der Geschichte. Gondrom-Verlag 1988. ISBN 3-8112-0368-1. Novissima mutatio die 28 Ianuarii 2018 hora 14:42 facta.